This is the 23rd sthalam on the southern side of river Cauvery. 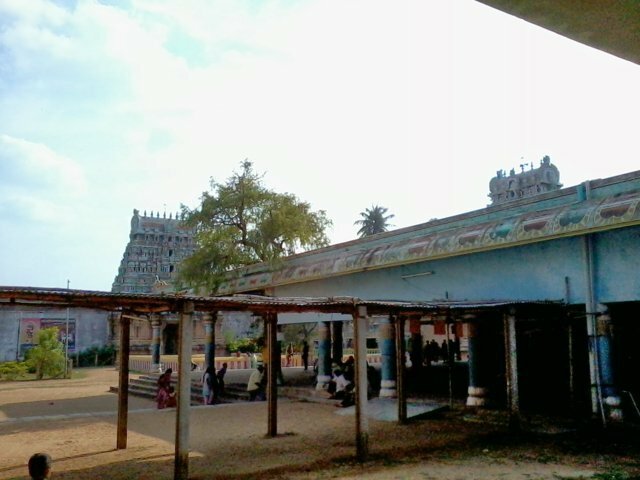 Thiruganasambandar has sung hymns in praise of Lord Shiva of this temple. 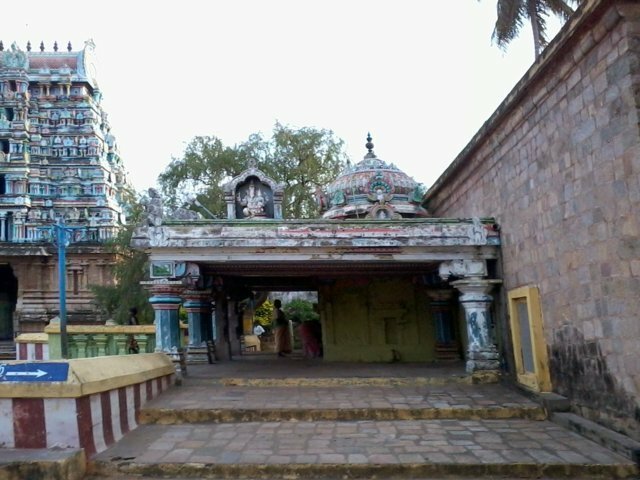 This temple is located in Patteeswaram about 6-7 kms in the South western direction from Kumbakonam on the banks of the river Thirumalai aaru in Tamil nadu. The carpet area of the temple is 2,00,640 sqft with 4 towers in 7 stages on each of the four sides. The deity is called Thenu-pureeswarar and is in the east facing pose. It is said that it is self incarnated. The Lord's consort Devi Gnanambigai has a separate sanctum facing south. The temple tree is Vanni and the theertham is gnanavavi. Nandhi and palipedam are not in line with moolavar. 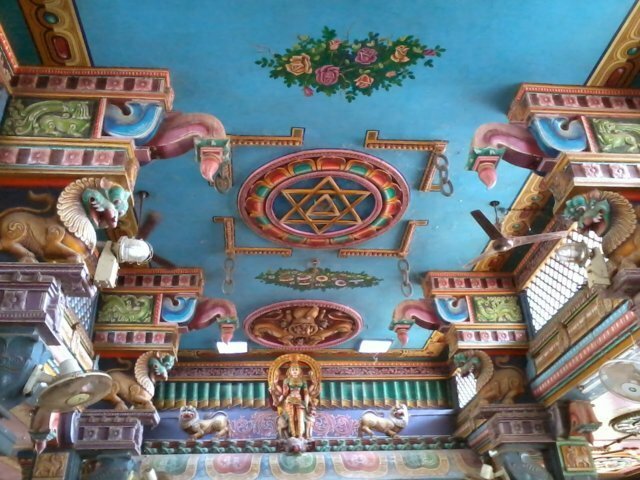 Lord shiva gave Muthu Pandal in this temple. 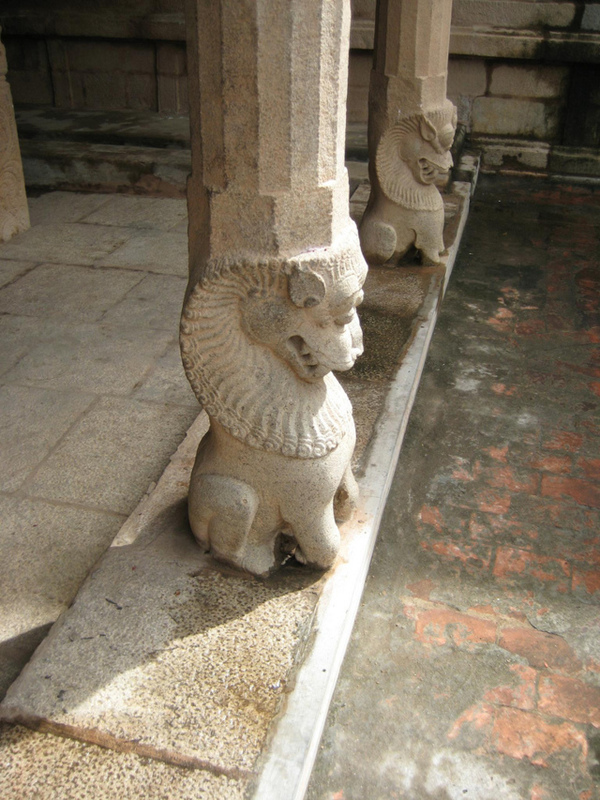 Kamadhenu worshiped Lord shiva, sirpam in stone pillar. In maha mandapam moorthy for Govindha Theeksthar and his wife who had done thiruppani. Big size suthai Dwarabalakars can be seen at the entrance of artha mandapam. Bairavar is beautifully chiseled, worth to see the beauty. 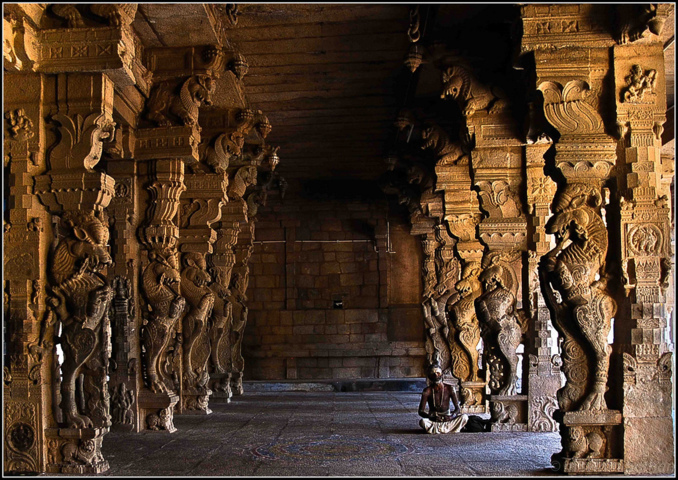 Rama installed Shiva Lingam here to liberate himself from Chaaya Hathi Dosham after the battle with Ravana. The place derives its name Patteeswaram from the worship of a Patti Kandru-cow calf that made a sand Shivalainga and worshiped here. Lord is Patteeswarar. Lord asked Nandhi to move to enable Him to see Sambandar coming to the shrine with the Muthu Pandal. Mother Durga appears soft looking on Her Lion vahan, Her feet on demon Mahisha holding conch, discus, bow, arrow, sword, armour and a parrot. It is also said that Sage Vishwamitra succeeded in this place only attaining the full power of Gayatri Mahamantra, according to some sources. 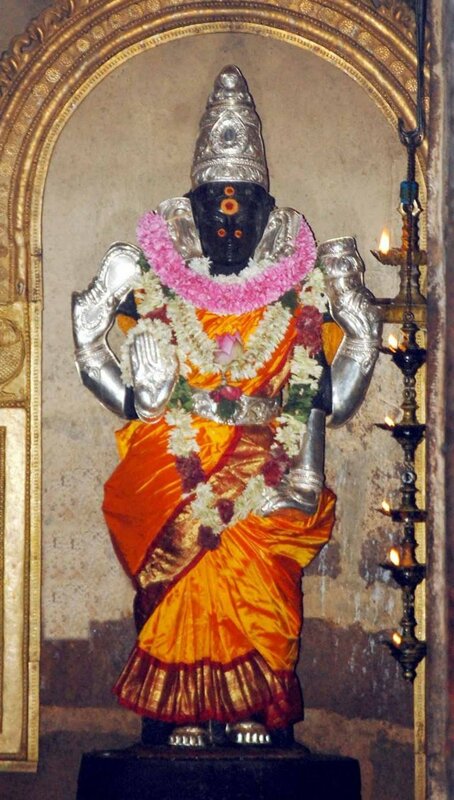 Sage Markandeya had worshipped Lord Patteeswarar in this temple. 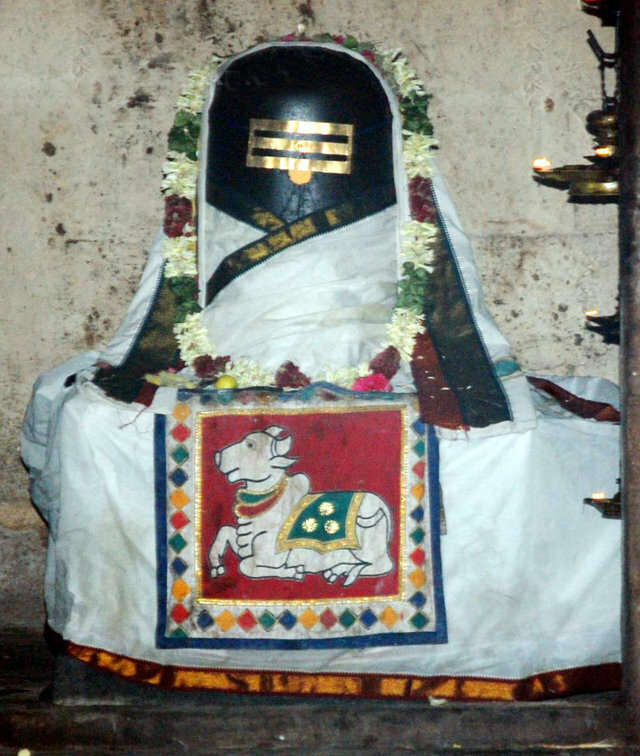 Parasakthi undertook penance here invoking the blessings of Lord Shiva. Kamadhenu sent her daughter Patti to support the penance. Pleased with Parasakthi’s prayers, Shiva appeared here with his long uncombed hair (Sadai Mudi) and provided darshan. 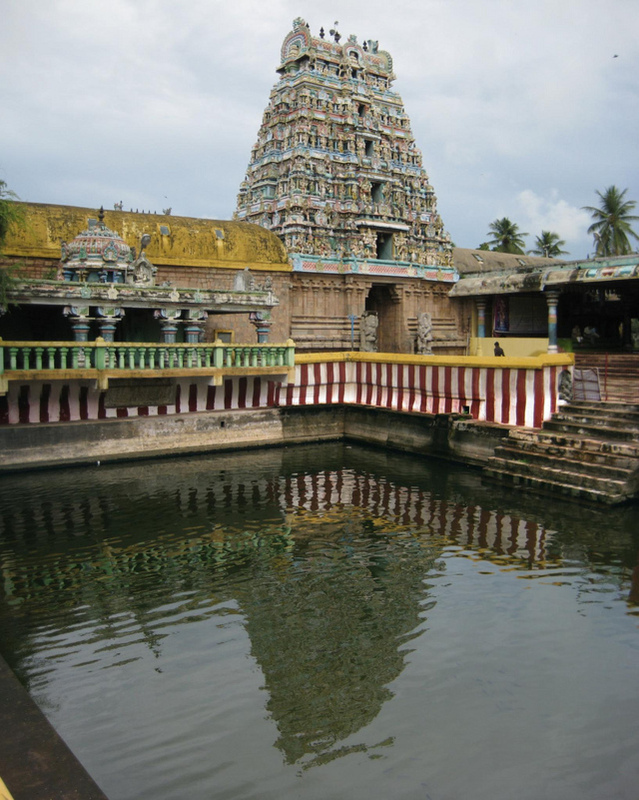 As Patti played an important role in the success of Sakthi’s penance, this place came to be called Patteeswaram. This is one of the important places where Kamadhenu, the sacred celestial cow, visited and undertook penance invoking the blessings of Lord Shiva. Answering her prayers, Shiva appeared here and promised to fulfil the wishes of devotees who offer sincere prayers at this temple. In memory of this event, Lord came to be referred to as Dhenupureeswarar. Medhavi Rishi who was undertaking penance in the Maalava kingdom left his ashram to attend a yagna. He assigned his disciple Dharma Sarma to take care. On return he found that the cows had become weak significantly impacting their ability to deliver milk. An angered rishi cursed him to turn into a dog. To liberate himself from the curse, Dharma Sarma, now in the form of a dog, came here to the South of Cauvery to Devi Vanam. When the sacred water fell on the dog, he was liberated from the Sage’s curse and regained his original form. King Chitrasena of Kaambeeli had no child. To liberate himself from the sins of the previous birth, he came here with his wife and undertook bath in the sacred tank. Pleased with his prayers, Lord Shiva appeared before him in Vaikasi and blessed him with a child. As a thanks giving to the Lord, a delighted king started the grand 10day festival in Thai. The Great Chozha kings including Raja Raja Chozha I had great respect for Durgai and the Goddess acted as the security guard for them. Also, before their departure for any battle and also after their return, the Chozha kings would invoke the blessings of Durgai. Towards the end of their regime and with their palace at Patteeswaram going into ruins, they moved the idol of Durgai into the Northern entrance of the Dhenupureeswarar temple from where she currently provides darshan to devotees. At this temple, Durgai, with Simha Vahana to her left, is seen in a cool form with eight hands and lacks the typical aggressive looks. Right from the Chozha period, Durgai has been so popular as she solves all the problems of devotees that this temple has come to be referred to as the Patteeswaram Durgai Temple. In centuries gone by, the landmark to this place was denoted as being South of Arasalaru and North of Mudikondan River. 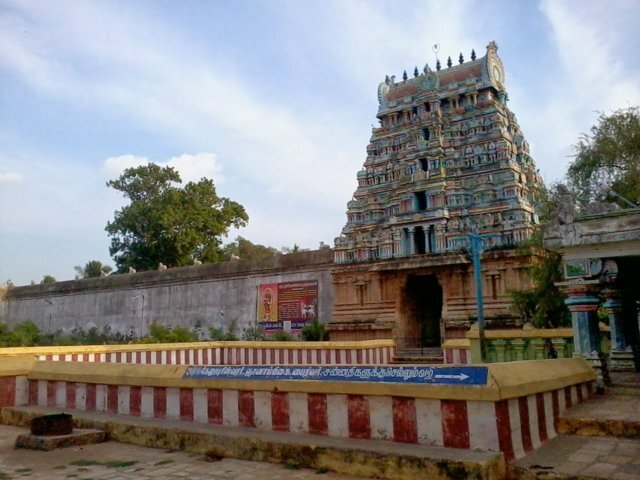 In the 8th Century AD, Pallava King Nandivarma II built the beautiful Nandipura Vinnagaram -Jagannathan Perumal Temple (Divya Desam), a few kms East of Patteeswaram giving this region a grand stature and a rich place in history. Subsequently, Rajaraja Chozha, Rajendra Chozha and Kulothunga Chozha made this an integral part of their kingdom from where they made several important decisions. Though the temple here is a Shiva temple, the temple is known for the Durga here. Durga is considered to be the combined force of all the Gods to destroy the evil forces. Durga in Sanskrit means a fortified or well protected place. Durga protects the mankind from the evil forces. She removes the negative thoughts such as selfishness, envy, hatred anger and ego. The shrine for Durga is near the Northern entrance of the temple. Cholas are believed to have originally installed this deity in their fort. The idol was removed and installed here at this temple after the fall of the Chola dynasty. 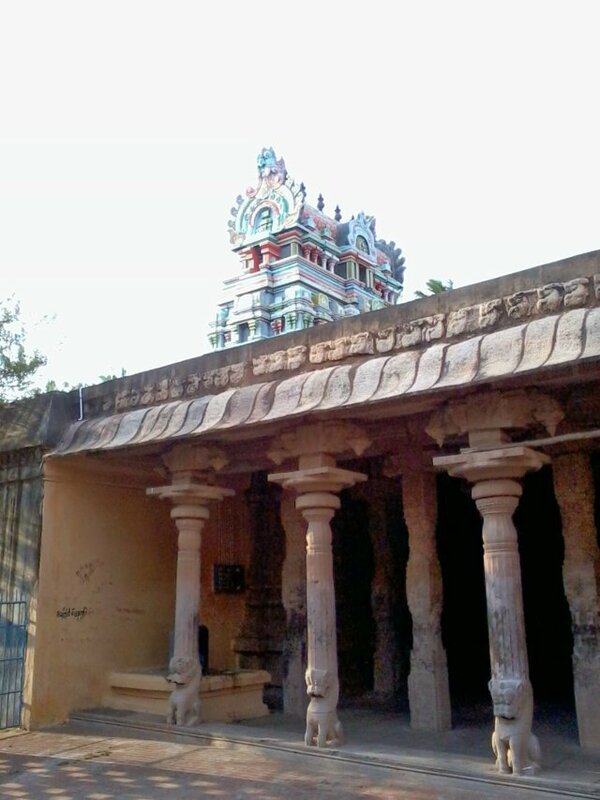 Along with the idol of Durga, the idols of Swarnaganapthy, Shanmuga and Bhairavar were also shifted to this temple from the fort. These four deities were guarding the four entrances of the fort. The Cholas were ardent devotees of Durga and always worshiped Durga before going to war or when they were faced with making an important decision. The Durga here is a Shanta Swarupi (calm or peaceful countenance). She is seated on her vehicle Lion and is seen with here foot on Mahishasura. The Goddess appears in Tribanga (three curved) posture. Durga here is ashtabhuja or with eight hands. She is seen holding conch, discuss, bow, arrow, sword, shield and a parrot in Her hands. She has three eyes and jewels adorn her ears. An unusual aspect of this Durga is that her vehicle – the lion – is seen facing the left side instead of the right side, which is usually the case. Goddess Durga here is considered to be very divine and powerful who showers Her blessings on Her devotees. People afflicted with Rahu and Kethu Doshas worship at this temple during Rahu Kalam; for, it is believed that during the Rahu Kalam, Rahu worships the Goddess everyday. Worshiping Her on Tuesdays, Fridays, Sundays, New Moon days and Full Moon days and Ashtami and Navami (8th and 9th day from the new moon or full moon day) is considered special. People throng this temple to seek the blessings of Durga in finding suitable match for their daughters. Locals vouch that the prayers are always answered. 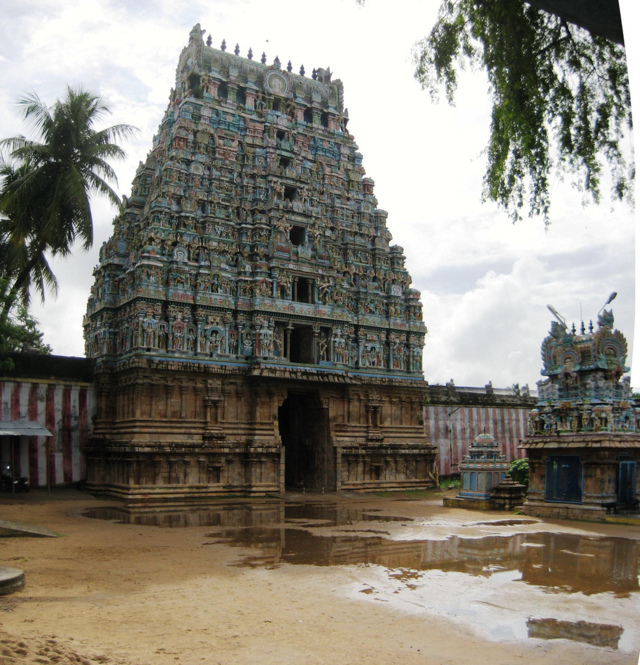 Location: This temple is located at about 9 Kms south-west of Kumbakonam and about 3 Kms south-east of Swamimalai. Bus facilities are available from Kumbakonam and Thanjavur. The nearest railway station (2 Kms) Darasuram is situated on the Thanjavur - Kumbakonam section of the Southern Railway.